I'm new to MB and I finally have a wagon to call my own. I picked this up in Bellevue, Wa last month. It has 40k miles now. I'd also like to use this thread as a place to ask some questions about the wagon. 1) what are the most popular aftermarket parts sites? 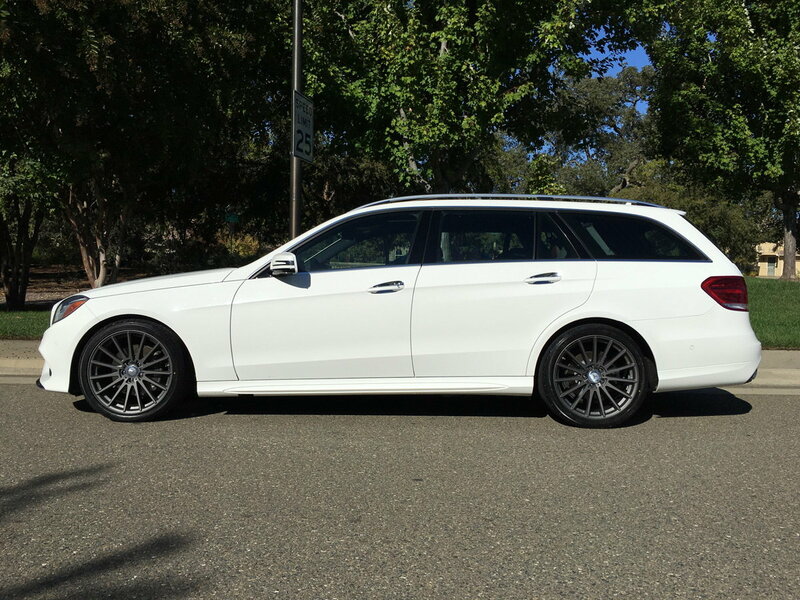 I haven't encounter too much on offer for the e350 wagon. most coils, diffusers, lips etc are for sedan or e63 wagon. 2) Lowering question: In order to lower, do i need front coilovers? i can't find many options. any ideas? I understand that i will need lowering links for the rear airride. do i need to reprogram the ecu to add these? I'm sure I'll have more questions soon enough. So far the ride is great. Have no complaints so far and love the look. Also, OREGONMON, im pretty sure ive seen you cruising around Boones Ferry a few times. You don't need to reprogram the ecu to use lowering links for your airmatic, you're just tricking the car into thinking its too high so it lowers itself. As for the other questions, other people are more qualified to answer those, I just have airmatic all around so all I needed were lowering links. Thanks. I appreciate the info. nice ride. You'll find a lot of wagon love around here. Rear airride? I am not familiar with that. Is that a special wagon feature? most wagons have front static and rear air suspension i reckon. nice ride OP. would love to own a wagon someday. congratulations! I just called H&R to confirm that they offer no coilover options. I asked about using e350 sedan front coils and they "do not recommend it"
Wondering if anyone has info about e350 sedan front coils on a wagon. 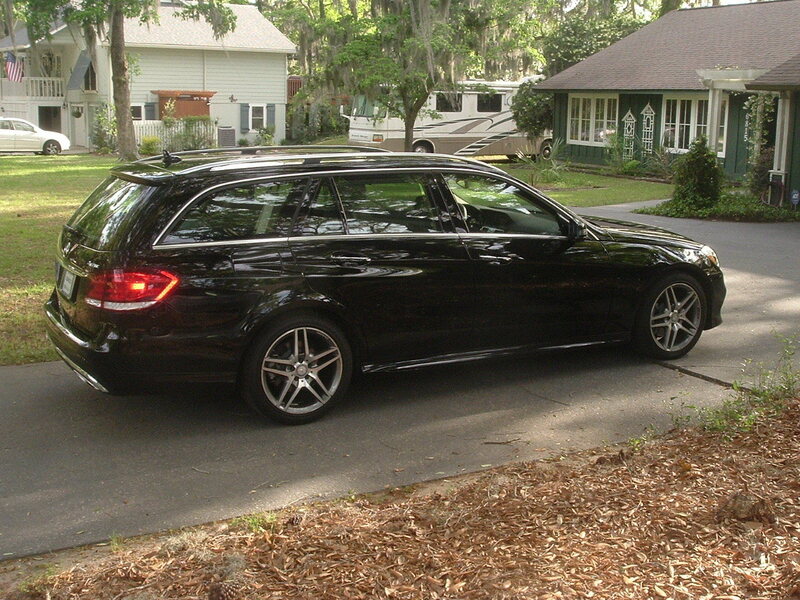 I also have an E350 2014 wagon with 30,000 trouble free miles. What do you expect to improve by lowering or changing the springs? The factory got the car just right when they engineered it. I'm just trying to be flossy. Im looking at wheels and just curious for some feedback. looks like the rear tires are ever so slightly taller than the fronts. will this greatly affect the 4matic? For a 4matic, you're supposed to have the same size on all 4 corners. Also there's lots of threads on here about people with bent 17 and 18's and also lots of people going back to 17 and 18 after too many bent oversized wheels. Last time I had my 18 inch wheel bent back, the guy was telling me how OEM was easy to fix, but aftermarkets were worse because they just tend to crack so you can't really fix it and they seemed weaker than OEM. Awesome car! good luck with it and drive it in good health! i just bought a 2011 E350 Wagon and i love it so far! Beautiful wagon! Welcome to the forum. For the 350's there is very little offered in way of modification. I look forward to seeing what you find. So far for me I purchased the "OE Tuning" tune for the direct injection V6 on our cars, the m276, which I like a lot, and switched my seats for AMG Napa leather, active dynamic multi-contour seats front and split folding rear. I have found little to nothing as far as wagon "mods". So far, I think its just gonna be H&R e350 sedan Coils up front and Ghostlink Airlift Links for the rear. Plus wheels and tint. I haven't found many OEM+ sites. Most people seem to buy everything from eBay which seems very "UnMercedes-like." I've been staying away from eBay, lots of fakes and counterfeit parts or just substandard stuff out there. Just sticking with the majors like rockauto, advance auto, Amazon, and some of the sites that cater to MB like ECS Tuning. There's also OEM MB parts site that discount close to 30% so they're somewhat reasonable when you have to get MB specific parts. Tump43, I PM'd you in regards to your leather seats, where abouts in NY are you located ? Very Nice! I'd love to find a Wagon/Estate, but they are not very common in Florida for some reason. I'm in Millwood/Chappaqua -- 15 minutes north of White Plains, 1 hr north of NYC. You? Just bought this 2016 with 1300 miles. Love it. What do you guys use for the back cargo area to protect it? Did you ever end up lowering it yet? ^would also like see this. i recently picked up the Weathertech version. Fits nice but i may trim the load area lip to prevent snagging. Looks like MB updated their accessories web site to reflect the newer body style. You can probably find anything you want by going to the dealer. As far as some mods go, I added some wheels. I went square all around so I wouldn't mess with the 4-matic system.